There are SO many toys to give to babies! From things that blink to big moving toys, there are always gifts to give. 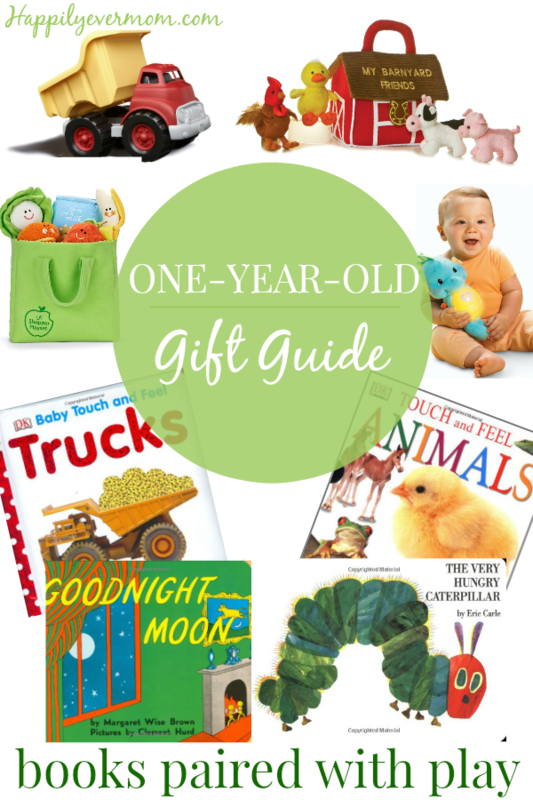 But, my favorite 1 year old gifts are books. When I give a gift, I pair books with a fun, themed toy so kids get the best of both worlds: play time & reading time! Little Blue Truck is a rhyming book about a truck that beeps and acknowledges all of the animals along the road. When a dump truck gets stuck in the mud, no one hears his call for help except for little blue who gets all of the animals to help, too. This touch and feel truck book is one of our favorites. It’s by far one of the best touch and feel books we’ve found – the sticky roller is worth the price of the whole book! Pair either of these books with this Dump Truck to continue the truck theme! Our touch and feel farm books (we love this book as well as this one, too) have always been a favorite. My kids love saying the sounds as they touch the books ~ it’s a great way to encourage early language. Pair it with this adorable barn set and hear animals make real sounds when you squeeze them (my four year old still plays with this set!). *note: this has been a HUGE hit with all of my babies and people LOVE this when they see it at my house! The Very Hungry Caterpillar is a classic board book…that we just got in our house! As the caterpillar eats all of the different fruits and vegetables, baby can play with their first set of play food during or after you read. We love that this play food set for baby is soft, has an actual peeling banana, and a rattle in the apple ~ the grocery bag is so much fun for kids to load and unload, too! Here’s a fun book to get baby ready for bed, but the classic Goodnight Moon is always a hit in our house, too. Although, we can’t live without Time For Bed either – it’s such a fun way to get kids ready for sleep! Pair any of these books with this great night light projector. Or, if you had a glow worm growing up, this glowing sea horse is adorable, too. Our first word books are my baby’s absolute favorite. I love this first words book because it focuses on words that are actually in baby’s environment. Pair it with these bath alphabet letters and numbers to give a learning toy that will last. We love Goodnight, Gorilla! It’s such a fun wordless book that will grow with baby. And, Dear Zoo lets baby find animals underneath the flaps ~ so fun! Pair these books with the giraffe Sophie teether – the newest teethers are easy to grasp, too! When we got our Good Dog, Carl books, I had no idea what a beloved book it would become. My preschooler now “reads” this book to her younger brother. Although she knows there’s no words in the book, we try not to point it out when she “reads” it!! Tails are not for pulling is a great book for babies and toddlers who already have pets in the house! Pair these books with this Laugh and Learn Puppy. It was something my daughter used to carry around and loved to play with. But, you can always get these sensory balls that both pets and babies can enjoy together! Our favorite board books of all time are our Mom Kisses and Daddy Hugs books. These are great books to read before bedtime or for you to read before you leave for work. 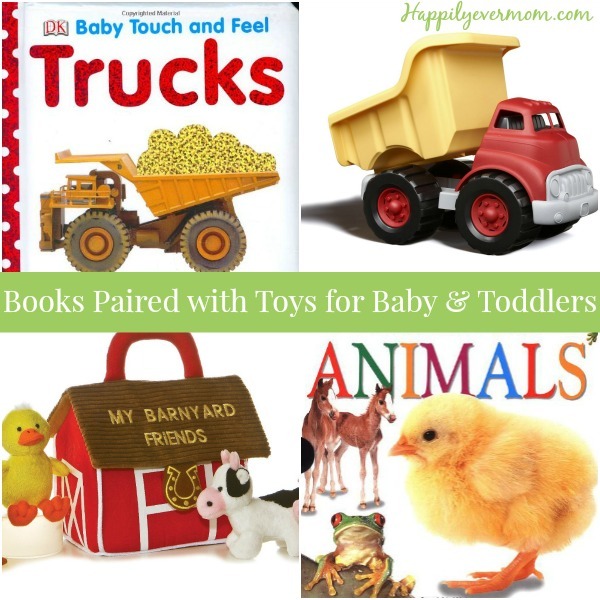 Pair these books with a photo book for baby so that they can look at their favorite family photos. Be sure to follow our Pinterest board for more creative gift ideas that are for kids and from kids! 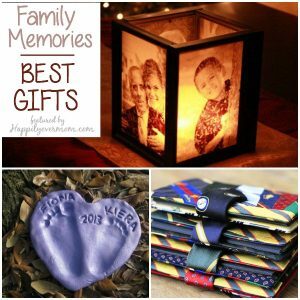 Follow Katie Joiner | Happily Ever Mom’s board Gift Ideas for/from Kids on Pinterest.